In July, I had the opportunity to go on a pilgrimage, a meaningful journey to a sacred place, in order to deepen my life’s purpose: to do the Great Work of our times. (Thomas Berry urged all of us over 30 years ago to engage in the Great Work of bringing forth a mutually enhancing Earth/human relationship.) Sister Maureen Wild, SC, and I followed Athabasca River (in western Canada) from its source in the Columbian ice fields. 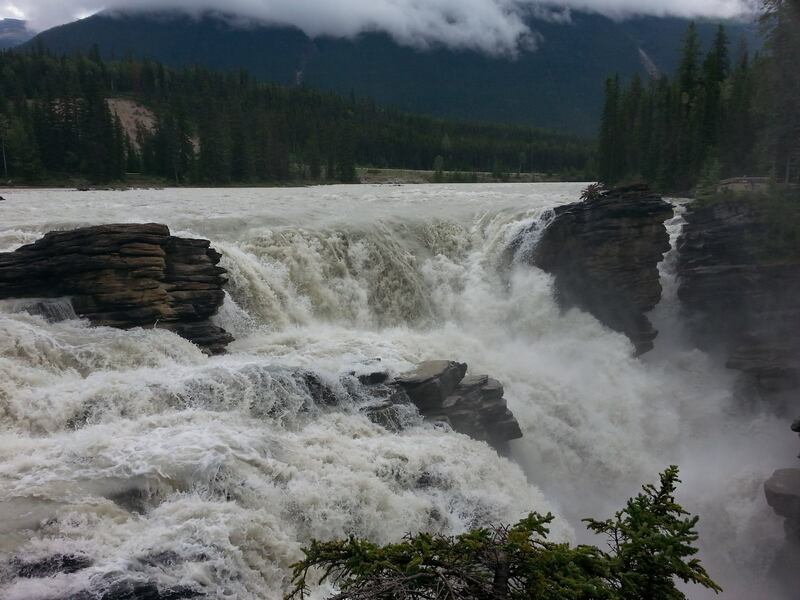 We saw her acquire strength and power and tumble into the Athabasca Falls in Jasper National Park. We observed some of the places where she had carved rock with torrents and rivulets a long time and where she flowed lazily through quiet towns sculpting a path north. The Athabasca has one mission, to bless all life in its path with pure glacial water; but to do it she has to pass through hell. She does not come out unscathed. Maureen and I tailed the river to Fort McMurray, Alberta, Canada where she is used by the tar sands industry for its mining operation in the world’s last remaining “oil” field. Second only to Saudi Arabia, the region is said to contain up to 2.5 trillion barrels of “oil,” but to get at it entails destroying an ecosystem and an indigenous way of life. The number one market for bitumen is the United States. To extract a barrel of bitumen requires the excavation of two tons of Earth and sand and three barrels of fresh water from the Athabasca. That water use is equivalent to the water use of a city of two million people for a year! 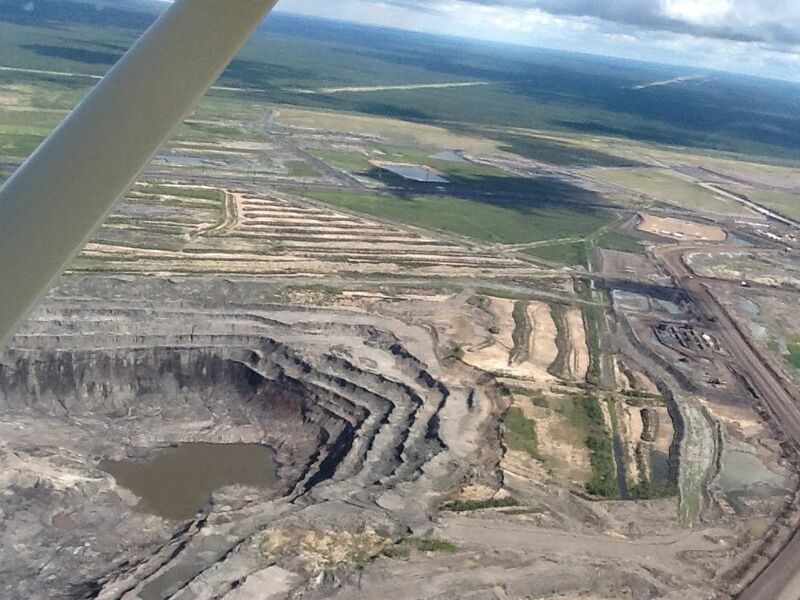 Much of the water gets “recycled” in tailings ponds, used to settle out solids in the oil, water, chemical mix. The ponds are covered with the sheen of oil, so small cannons boom to keep birds from landing, 24 hours a day. If the “oil” is too deep to mine, the industry also uses another method of extraction called in situ. It is a method that steams out the bitumen, but it burns natural gas to boil the water into steam. Estimated use of natural gas in boiling water — enough to heat six million North American homes every day! If this is beginning to sound like an energy intensive, unsustainable method to obtain bitumen which requires even more diluting and refining to become something that will actually flow through a pipeline, I think you are on to something! Worst of all, each barrel of bitumen produces three times the greenhouse gas as conventional oil, putting us in the ever deepening hole of global emissions fueling climate change. Maureen has First Nation elder friends in Fort McKay, Celia and Ed Harpe, who live just down river from the industry. They invited us to a dinner of moose meat and new potatoes. They shared stories of their traditional way of life. They no longer drink the water from the Athabasca, nor do they eat her fish which have been documented to have tumors, cancers and lesions, nor do they swim in the river or pick the berries and herbs growing wild. They say that the wildlife has disappeared along with the forest and I wonder what the moose and the beaver are drinking wherever they are? 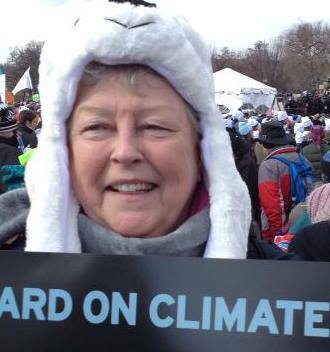 Celia is an outspoken critic of the Tar Sands industry. She says there have been no frogs on the river for 40 years. Canaries in the proverbial coal mine, they cannot survive in a toxic environment. The people, too, have come down with asthma and lupus and cancers I couldn’t even pronounce. Celia said every family had someone who was sick, or already dead including her own. Her husband Ed has lung cancer. Her sister Dorothy died of lupus. Celia’s grandson, 32, was recently killed in an industry accident. We happened to be there for his memorial service. A way of life has been supplanted by an industry. A people’s culture and health have been compromised. The people, caribou, bear, moose, fish and owl have to deal with a brew of heavy metals including arsenic, thallium and mercury in the Athabasca, while she continues her journey to the Arctic Ocean forever changed. We might summarize our present human situation by the simple statement: that in the 20th century, the glory of the human has become the desolation of the Earth and now the desolation of the Earth is becoming the destiny of the human. What a powerful experience. Thank you for sharing this information, pictures and journey. Blessings on your great work! Thanks for your comment and appreciation, Chris. I obviously agree!